A stroke can be life-threatening and debilitating. It can occur with little warning. So why does it happen? 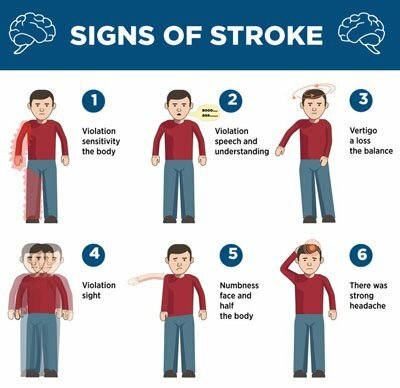 A stroke occurs when the blood supply to part of your brain is interrupted or reduced, depriving brain tissue of oxygen and nutrients. Within minutes, brain cells begin to die and is considered a medical emergency. Timely treatment is crucial to minimize brain damage and potential complications. Strokes are the third leading cause of death in the United States. Nearly three-quarters of all strokes occur in people over the age of 65. The risk of having a stroke more than doubles each decade after the age of 55. About 600,000 of these are first attacks, and 185,000 are recurrent attacks. More than 140,000 people die each year from strokes in the United States. • Stokes can happen at any age. • High blood pressure is a high-risk factor. • Up to 80 percent of strokes are preventable. • Having a family history of strokes increases your chances. • About every 40 seconds someone in the United States has a stroke. The type of stroke a person has will depend on the treatment. A surgical procedure can be performed to remove plaque buildup or open blockages. Medications can be taken to control high blood pressure, lower the chances of forming clots and manage atrial fibrillation. For post-stroke recovery, occupational and physical therapy may prove helpful. If you or your loved one suffered from a stroke, contact a Neurologist at First Choice Neurology.